All Out to Stop Union-Busting at Bröd/Hot and Crusty! Mahoma López speaking at January 28 protest. This past fall, directly inspired by the Hot and Crusty campaign, hundreds of immigrant workers at B&H Photo launched a drive that won union recognition.2 B&H workers have actively supported the struggle at Bröd Kitchen: several dozen joined a picket at the 4th Street location on January 22, and came out again today. The showdown began on January 14, the very day negotiations for a new contract at the 63rd Street restaurant were supposed to begin. Bröd announced then it would close the store the next day. When the union denounced this and announced plans to protest, management acceded to a 30-day extension. In 2012 as well, the owner of the Hot and Crusty franchise used the tactic of closing the store after the workers won a union recognition vote. But after 55 days of picketing, the bosses gave in. The scurrilous anti-union screed was supposedly a message from workers at the West 4th Street store – a transparent divide-and-conquer ploy from the company, which hopes to use and abuse the workers there while claiming to be their friends. Then, if they succeed in breaking the union at 63rd Street, management will quickly take away any “privilege” supposedly bestowed on the West 4th employees. Yet Bröd showed its hand from the get-go: right at the bottom of the message, in big bold letters (followed by four exclamation points! ), is the signature of company manager Monette de Botton. This dim and dirty tactic was aimed at counteracting support from students and faculty at NYU. Bröd bosses clearly see this as a weak point for their union-busting crusade. And in fact, NYU students together with unionists of the Graduate Student Organizing Committee (UAW Local 2110) were prominent at the protests yesterday and today. One of the chants at both protests was “Dueños de Bröd: No tenemos miedo” (Bröd owners: We are not afraid”). Another was “Dueño, mira: La tienda está vacía” (Look, boss, your store is empty). On both occasions there weren’t even a handful of customers, and today when the workers arrived the managers put up a “Closed” sign and locked the door. Indeed, it is the owners’ fear and loathing of the power and example of workers who stand up for their rights that led them to lash out so blatantly by firing brothers Mahoma and Marcelino. A protest sign read, “Bröd Owners, Listen Up: NYC Is a Union Town.” Others pointed out that “NYC Labor Has the Power to Stop Union-Busting.” The company may have calculated that the Hot and Crusty union was isolated, but the outpouring of support has dramatically shown that the opposite is the case. Responding to an appeal from Mahoma López, the New York Central Labor Council declared its backing for the struggle and put the January 28 protest on its calendar. A taste of labor’s power was in the air at yesterday’s boisterous mass rally and picket on West 4th Street. Blocks away you could hear the crowd chanting its support for the courageous unionists of the Hot and Crusty Workers Association, shouting “Bröd workers, we are with you” and “What’s disgusting? Union-busting!” The list of those attending is a long one, including activists from the Laundry Workers Center, GSOC-UAW, NYU Student Labor Action Movement; contingents from the Bricklayers union, UNITE-HERE Local 100 and the United Food and Commercial Workers. Postal and transit workers joined at the protest with the NY Taxi Workers Alliance, DC 37 Local 768, as well as members of the Coalition of Black Trade Unionists, Teamsters Local One-L, CUNY faculty union (PSC) and CUNY Contingents Unite. In addition, there were several members of the United Federation of Teachers, and UFT union delegate Marjorie Stamberg gave a rousing speech on behalf of Class Struggle Education Workers. An entire Union Semester class was brought to yesterday’s protest by an activist from the CUNY Internationalist Clubs, which mobilized dozens of CUNY students and adjuncts. They joined with the Internationalist Group, which played a major role in building the rallies and was extensively involved in the Hot and Crusty campaign three years ago. Among the left, labor, immigrant and community groups that came out were Justice First, People’s Power Assembly, Brandworkers International, Families for Freedom and the Street Vendors Project. The message was loud and clear: New York’s powerful labor movement, together with a very broad range of immigrant rights and student activists, are fed up with union-busting and attacks on the basic rights of the workers who make this city run. We will not tolerate the attempt to destroy the advances, the hopes and the dignity of workers like our brothers and sisters who gave such an inspiring example for us all in the Hot and Crusty struggle. The war on working people being waged by Wall Street and both capitalist parties must be defeated. We have the power to defeat this onslaught. Now is the time to use it. 1. 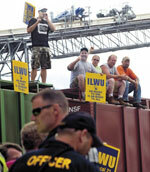 See “Hot and Crusty Workers Win With Groundbreaking Contract,” The Internationalist special issue, November-December 2012. 2. See “V-I-C-T-O-R-Y! B&H Workers in Big Win for Labor and Immigrant Rights,” The Internationalist No. 42, January-February 2016.